Thankfully, when Wembley undergoes a period of existential angst, the result isn't “snore pie with yawn sauce,” as they say in the 1980s Gen X favorite Jim Henson's Fraggle Rock. 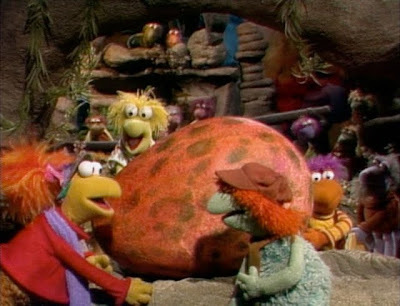 Even though the arrival of an egg threatens to ruin swimming class for the others since it splashes right down into Fraggle Pond, Wembley sees it as a call to action in order to give our funny Fraggle what he believes is some much-needed purpose in his life. Ignoring the snickers of others since genetically it's not his egg and even if it was, he'd technically be a “dad” instead of a “mom,” Wembley parks himself right on top of the egg with the firm intention of providing both parental roles for the orphaned creature. 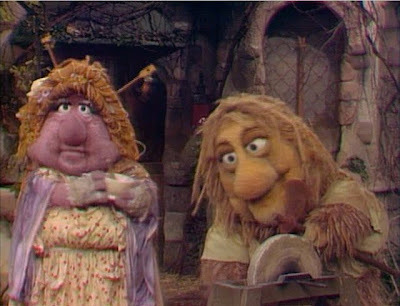 After predictably, the Fraggles realize that the orphan doesn't belong down in Fraggle Rock and instead has a family of its own, Wembley discovers just how much sacrifice is involved in being a real parent when forced to put the animal's needs before his own. 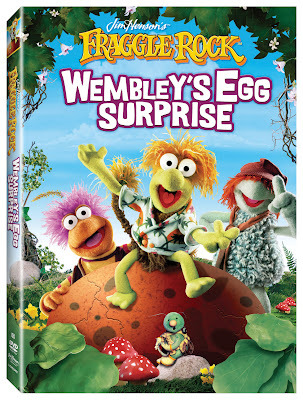 Just one of a trio of episodes contained in Wembley's new Lionsgate Fraggle Rock title, the DVD features delightful pics from the show's 1983 televised season centering on the seasonal ideas of blossoming, birth, renewal, and the promise of the Spring as well as the fitting idea of an Easter Egg Surprise. Additionally, there's a nice subtext included with the release as it's not only immediately recognizable retro fun for fellow Gen Xers but it's also irresistible to the next generation who-- so far weaned on far too much 3-D and CGI-- will surely enjoy the renewal of a classic Jim Henson series from the man who helped make George Lucas' Star Wars series what it is today. 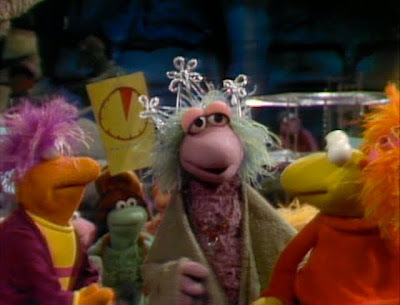 Encouraging teamwork in The Great Radish Famine, which gives Marjory the Trash Compactor a rare opportunity to run the show, she decides it's time for the Fraggles, the Gorgs and the Doozers to work together and regrow the radish crop in order to settle their differences and make new friends. Rounding out the nicely packaged, eye-catching 72 minute DVD with a great reminder not to give into peer pressure, especially when it's both dangerous and foolish, some of the Fraggles find its time to assert their independence and exercise good judgment when the oldest living Fraggle wants to take them on a pointless, perilous journey to see which one can become the true Ruler of the Rock. Released around the same time as Lionsgate offered the entire animated series of Fraggle Rock in a nice thin-packaged set, the two DVDs compliment last year's collector edition of the series from which this disc culls its shows. And while the picture quality and presentation does reveal its age as it doesn't sparkle on the same level as modern day children's programming, similar to Lionsgate's Care Bears, in the end it's the content of the works that matters the most. For, needless to say, when you hold up discs like Fraggle and any of the new Care Bears titles next to some of the more visually stunning but uninspiring, IQ and EQ free discs mass-produced today, I'm going to have to venture back to recommend the TV series from decades gone by.